You might have noticed that we've already reviewed this bike. What gives? Well, you know that one guy who whips everyone's asses on the climbs and the descents, bunny hops over a picnic table on the way home and then drinks everyone under the table that night? The carbon Remedy 29 is that guy. It goes up better than many of the bikes that it also goes down better than, and it smiles the whole time. How could we leave it out? Testers' forms were filled with comments like, "The Remedy 29 is a better climber than the Enduro 29 and might be a better all-rounder," and, "It's hard to say what this bike's strongest suit is because it really seems exceptionally well balanced–it's a very nimble, ridiculously playful bike." It's one of only a few 140-millimeter 29ers out there, but this bike's versatility comes down to much more than its travel number. Two of the year's best technological developments are at work on this bike. The first and most noticeable is the Re:Aktiv shock that Trek co-developed with Penske Racing and Fox, featuring a technology that Penske designed for Formula One called a 'regressive valve.' There's more about it on bikemag.com, but basically you get stable pedaling support and unparalleled bump devouring without ever needing to flip a switch. The other, Boost 148, is a wider rear-end spacing meant to build stiffer, stronger, mid-priced wagon wheels. Sure, $3,000 Enve wheels are plenty stiff, but steps forward like this actually help the other 99 percent. It's looking like the idea could be more widely adopted by the industry, and we think it's a great move forward. To find out more about this technology, check out our "Blueprint" video on bikemag.com. We had questions about the new bikes before we even got our test rigs, so we sent out a few queries—the kind of things we thought you might be asking yourself when you're looking at this bike. Then we sent out another round of asks if any major questions or issues came up during testing. Here's the feedback we received from Trek's mountain bike brand manager, Travis Ott. VERNON FELTON: What sets the Remedy apart from some of the other bikes in the all mountain/enduro niche? TRAVIS OTT: First, there are a few suspension technology pieces that are exclusive to Trek, including our Active Braking Pivot (ABP) & Full Floater suspension design, as well as our DRCV air shock that controls compression. We’ve also added a whole new performance aspect with our new RE:aktiv damper. Our Suspension R&D crew worked closely with Penske Racing Shocks and FOX to adapt Penske’s successful regressive damper used in F1 and other automotive racing to a MTB application. The result is a shock that offers lots of supportive low-speed compression damping under rider-induced forces, but then instantly and seamlessly transitions to supple high-speed compression damping under impact from trail obstacles. While in Trail mode, you'll notice how efficient yet supple that shock is. It's like shaving the tops off of bumps. While in Climb mode, it gives you climbing efficiency, but still with a very usable suspension. 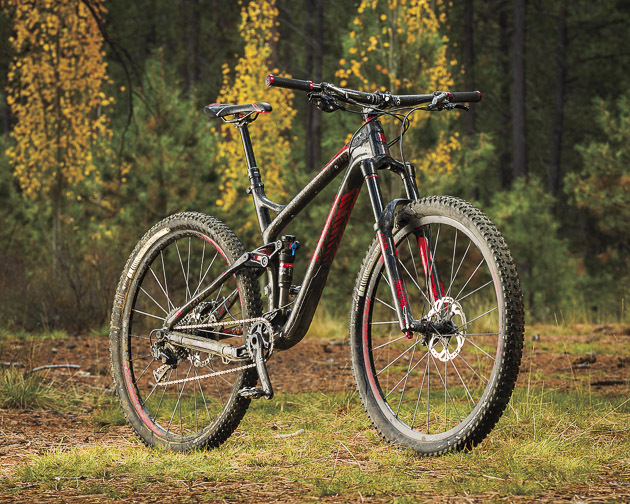 Additionally, the Remedy 29 features our newly developed Boost148 rear end. Bike Mag did a very nice Blueprint video on this last year. Boost148 addresses the last remaining complaint about 29ers, wheel stiffness, while adding other benefits. This new wider rear hub standard gives us a better bracing angle and enables us to make a 29-inch wheel that is as laterally stiff as a 27.5-inch wheel. It also allows us to fit wider tires and larger chainrings. Perfect for those looking to ride this bike in an enduro. While this is exclusive to Trek this year, it is an open standard, and there have been indications that other manufacturers will follow suit. VF: Boost 148 moves the cassette out a bit, which then requires a different crank spider in order to keep the chain line in a warm and happy place, right? Does this limit consumers' aftermarket crank options? TO: You'll see other manufacturers adopting 148 spacing and bringing great options to market very soon so riders will have more options shortly. VF: Who's the ideal rider for the Remedy 29er and how does that differ from the ideal rider for the Remedy 650b? TO: It’s all about individual rider preference. The ideal Remedy 29 rider is someone who places high emphasis on momentum, rollover capability, and overall speed. As a case in point, two of our top enduro athletes, Tracy Moseley and Justin Leov, choose the Remedy 29 as their go-to bike at the Enduro World Series. Riders who want a more playful nimble ride would find the Remedy 27.5 more suitable to their style, with the smaller wheels allowing them to throw the bike around more. Both are equally capable, it's just about riding style. VF: How much of a weight savings in the frame do riders get by opting for the carbon version of this bike over the aluminum version? TO: In just the frame, you'll save 513 grams (1.13lbs) by going carbon.